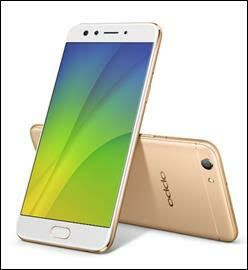 The camera phone brand OPPO, strengthened the ‘Group Selfie’ trend today by launching another Selfie Expert F3, priced at Rs 19,990 for the mid-range market. The F3 is the second in line dual front camera Selfie Expert targeted towards the Group Selfie generation after the recently launched F3 Plus. The F3 features a dual front camera - a 16-megapixel Selfie camera for individual selfies and a wide-angle lens for group selfie. The F3 First Sale begins from May 13th in 25 cities across India. The pre-order starts from today till May12th 2017. It will be available online on Flipkart exclusively. Consumers can also pre-order offline through OPPO stores. On this occasion, OPPO also revealed the Team India jersey in the presence of OPPO India President and BCCI CEO. The brand has always focused on cricket as a platform in its endeavor to connect with the consumers especially the youth. While it is the official partner of ICC starting 2016, it has strengthened the relationship further with the sport by associating with BCCI and becoming the official sponsor of Team India. “Cricket is a sport full of vigor and passion enjoyed by the youth of India. We believe that we share the same passion and spirit of pursuit of perfection as cricket that makes this association a perfect fit.” Said Mr. Sky Li, OPPO’s Global Vice President and President of OPPO India. “By partnering with the team, OPPO will not only further enhance its connection with the young consumers, but also engage with the country’s youth in its endeavor of providing them with the outstanding selfie-led photography experience.” He added. “One for Selfie, One for Group selfie “The Double View Group Selfie Camera gives a larger field-of-view, twice larger view than a normal selfie camera. The 6P lens maintains a high-level of professional image quality with minimal image distortion. This ensures that you click perfect Group Selfies! The OPPO F3 is also equipped with a 13 MP rear camera that has a 1/3-inch sensor. It is able to maximize light sensitivity, making for wonderful night time performance. PDAF technology makes for a snappy and fluid shooting experience. Even with moving subjects, the F3 focuses without a hitch. Capturing great shots at key moments has never been easier. The F3 comes in Gold and Rose Gold. Priced at Rs 19,990, the Gold variant of the F3 will be available from May 13, 2017 both online and offline. The pre-order of F3 Gold version starts from today till May 12, 2017. It will be available online on Flipkart exclusively. Consumers can also pre-order offline through OPPO stores. The brand will also have a lucky draw through the pre-order entries, and three lucky winners will get a chance to see the ICC finals live in London.